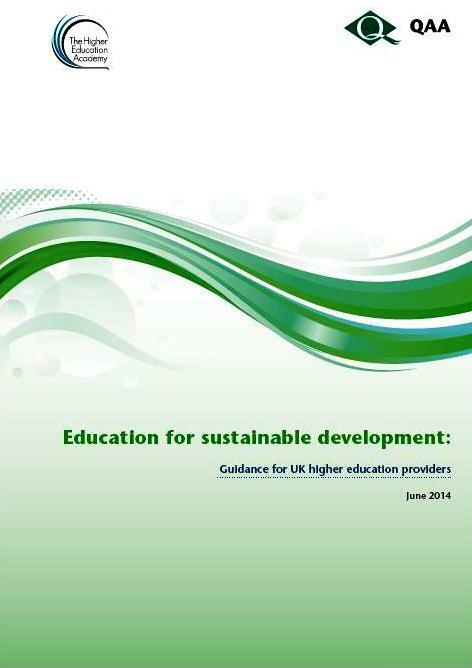 The QAA/HEA ESD Guidance, titled Education for sustainable development: Guidance for UK higher education providers, was published in June 2014. It is a product of collaboration between the Quality Assurance Agency for Higher Education (QAA) and the Higher Education Academy (HEA). The guidance aims to assist staff in UK higher education institutions in incorporating education for sustainable development (ESD) within the curricula of their respective disciplines. This reference point for use in curriculum design, delivery and review is mainly targeted at academics, educational developers and programme leaders. However, it may also be of interest to those with responsibility for quality assurance and enhancement, and the management of teaching and learning. Although this guidance relates primarily to undergraduate provision and assessment at Level 6, it may also be helpful to educators working at other levels (e.g. Level 5, including foundation degrees, and postgraduate). Moreover, it should be read in conjunction with the appropriate QAA subject benchmark statement. The ESD guidance recognises that there are many ways in which ESD could be incorporated within the curricula and therefore it is not prescriptive about delivery. It only presents an outcomes-based framework for use in curriculum design, and general guidance on approaches to teaching, learning and assessment. Moreover, it is not specific to any particular degree programme or subject specialism. The guidance was prepared by an expert group drawn from the UK higher education community with expertise in ESD. The group was chaired by Professor James Longhurst and co-convened by Dr Laura Bellingham and Simon Kemp. An earlier version of the guidance was subject to public consultation between November 2013 and January 2014. Image adapted from the cover of the guidance.